Cruises from Bayonne depart year-round. Bayonne, NJ is convenient to the sights and attractions of New York City. The cruise port is located on The Peninsula at Bayonne Harbor, formerly the Bayonne Navy Base. From the port, visitors have an unobstructed view of the Statue of Liberty and the Manhattan skyline. 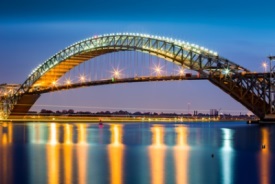 Bayonne is home to one of the longest steel arch bridges in the world, the Bayonne Bridge, which links New Jersey with Staten Island.